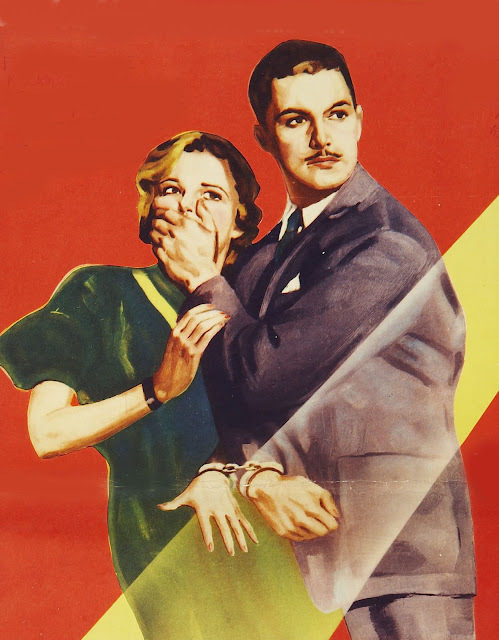 Greenbriar continues its participation in the third annual For the Love of Film: The Film Preservation Blogathon, hosted by The Self-Styled Siren, Ferdy On Films, and This Island Rod. They've been linking to Alfred Hitchcock-related posts from around the Net all week, and would remind readers to please visit this link to make donations toward preserving The White Shadow, one of the first films in which Hitchcock worked. Andre Sennwald was back eight days later (9/22/35) in pages of the Times to further celebrate The 39 Steps. This time he took US censorship to task for removal of isolated "damns" and "hells" from the Roxy print (It is an invitation to immoderate laughter to find that American censors have tampered even slightly ..., began Sennwald). From there was comparison to thudding H'wood effort at crime thrilling, Warners' uninspired Special Agent a ready target then smelling up the neighboring Strand. It now became a question whether any stateside mystery could measure up to The 39 Steps. The New York-World Telegram said only two came close ... The Thin Man and Bulldog Drummond Strikes Back. 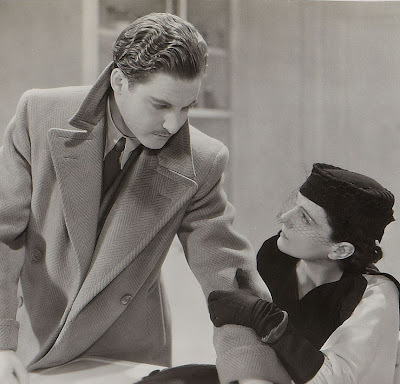 Indeed, The 39 Steps had risen well above British origins to reveal, said The Morning Telegraph, a thorough knowledge of timing and pace, and in the end it is a picture to take full and equal rank with the best that Hollywood has ever turned out. It's easy forgetting how important stage programs were to Broadway film openings. Far from mere extras, they were reviewed as separate entities by trades, and sometimes reaction was severe. The Roxy's live portion to accompany The 39 Steps was nearly as long as the feature itself and subject to much patron expectation for a ticket's worth of entertainment. 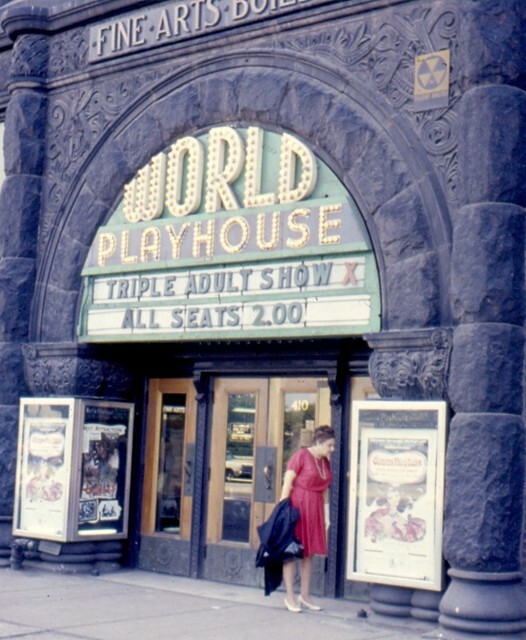 Broadway prices were higher than dime and quarters for subsequent play, so were naturally judged by goodies served in addition to screen fare. 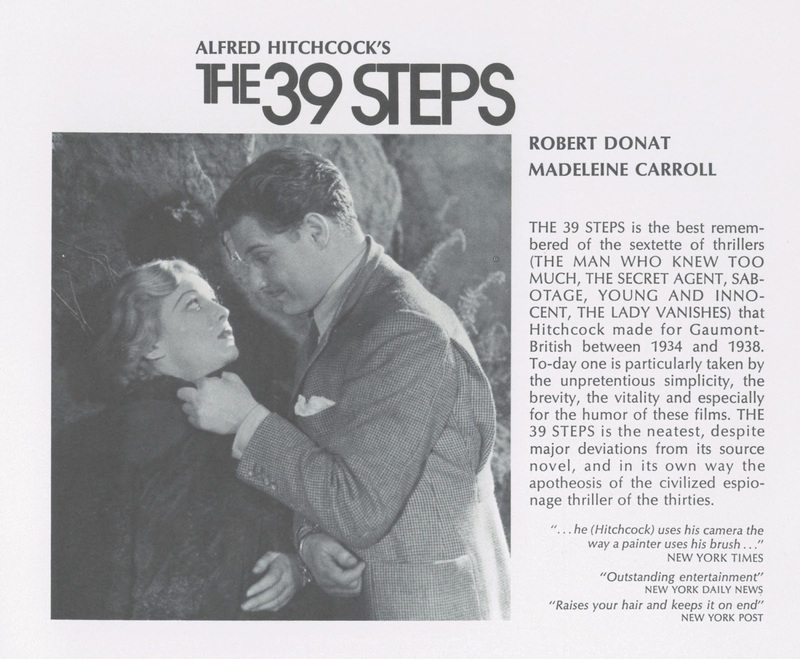 Variety liked The "bang-up" 39 Steps, but gave Roxy a pan for its jumbled, lame, and lethargic stage layout, which, among other things, tendered "three sections of girls" seemingly ad-libbing with their feet to accompany "The Old Spinning Wheel." 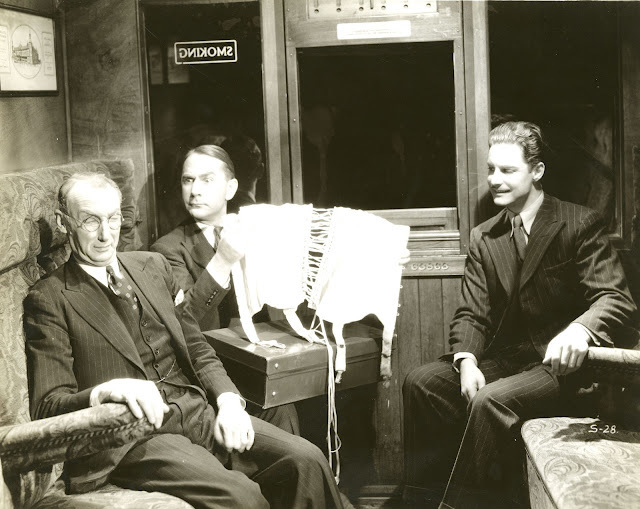 Comedian Cecil Mack had seemed funnier on previous Roxy occasion, and his meandering act was vulgar besides. The both-thumbs-to-nose gesture directed at the audience is unpardonable, and the many hells and damns don't belong, added Variety's reviewer. That latter was interesting as I'd always assumed Broadway houses kept profanity out of stage revues. How then to justify snip of swear words out of The 39 Steps with same language issuing from footlights? --- and try imagining stranger bedfellows for Hitchcock than hillbilly balladeer Billy Hill and wife, whose act was followed by a finale of tap dancers accompanying Rhapsody In Blue. As serious a breach as these was Roxy programming of animated Mickey's Kangaroo, outed by the trade for having been exhibited around town about a year ago, according to Variety. First-run customer demand for new product went across the board --- they'd tag stale bread even at a mere seven minutes length. 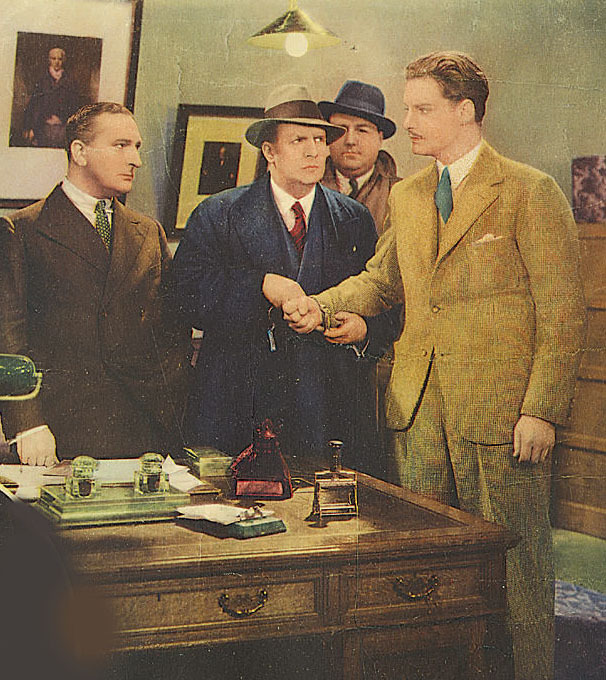 Variety noted a first-run Voice Of Experience short from Columbia that came with 39 Steps admission, but wouldn't forgive Mickey's Kangaroo "putting a penalty on the regular theatre-goer that is difficult to justify." Still, The 39 Steps clocked two weeks at the Roxy, with its second frame $33,000 confirming status as a bonafide hit. 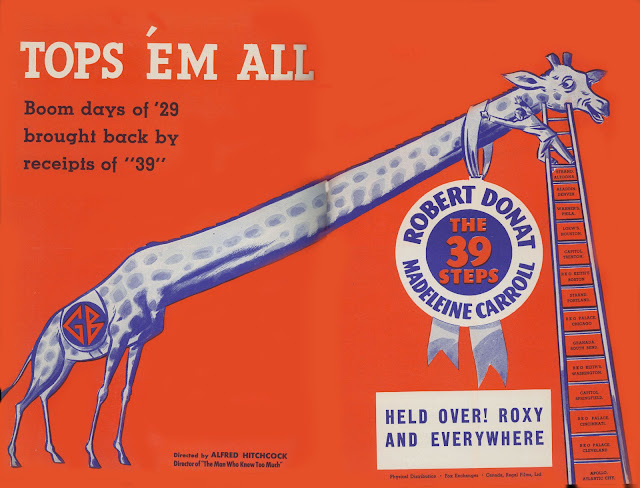 Gaumont used giraffe art to trade-advertise heights they'd attain, critically and commercially. 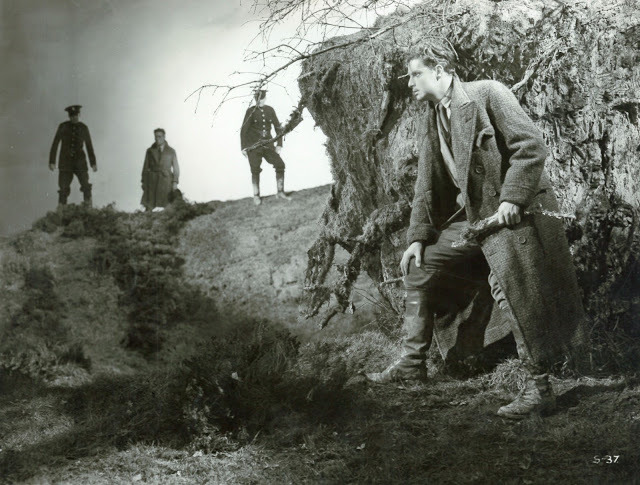 Review quotes were spread thin among autumn territories yet to play The 39 Steps. Maybe now even South and Midwest houses would take a chance and buy British, even as business continued variable depending on place. Minneapolis booked an October date and kept The 39 Steps an impressive three weeks, but then Oklahoma City fizzed after only three days (a deadly $650) and replaced Hitchcock's new kind of thriller with an old kind of western, Powdersmoke Range, Okies doubtless able to identify easier with down-home Harry Carey than suave Brit Robert Donat. Exhibitor comments were all over the map. I do not rate this picture as high as some critics have, said Leon C. Balduc of Conway, New Hampshire's Majestic Theatre, I can only call this a fair program picture. J.W. Noah of Ft. Worth's New Liberty and Ideal Theatres saw The 39 Steps differently, and came closest to modern-day appreciation for a classic he recognized early on: If all British pictures released in this country were as lively and entertaining as this mystery-melodrama, there would be a brisk competition between foreign and native factions over here, said Noah, The picture has a multitude of clever touches that cannot help (but) to make it the outstanding picture released thus far by Gaumont-British. Our patrons were intrigued by the title and came in profitable numbers. Everyone was pleased. 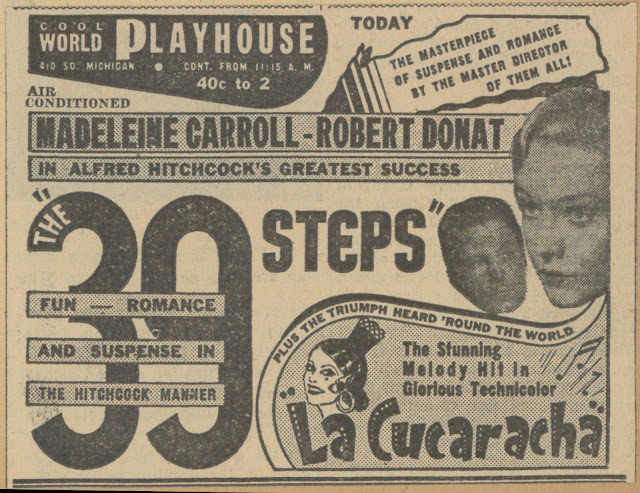 A later playdate and its ad support worth noting ... Chicago's World Playhouse was a 400 seat (at the time) showcase for foreign product that got The 39 Steps during a 1938 reissue. Impressive here is ad copy mentioning Alfred Hitchcock three times, twice by name, and once as "The Master Director Of Them All." Already there is reference to "Fun --- Romance and Suspense In The Hitchcock Manner." I've tried before pin-pointing just when Hitchcock became "The Master Of Suspense" for American audiences, settling then on a somewhat later date. Now I'm wondering if that wreath wasn't laid upon his head even earlier. Had any director established a critical (and audience) foothold so quickly? Even if Hitchcock's first discoverers were longhairs and art-mavens, still it's remarkable how prescient they were for recognizing greatness in him. Alfred Hitchcock's Greatest Picture! 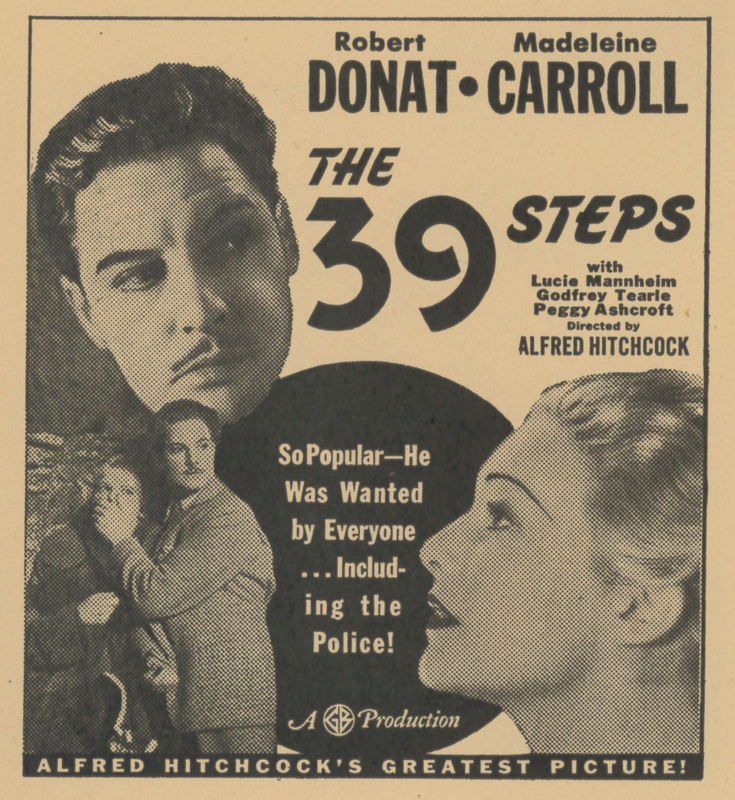 said fresh prepared poster art when The 39 Steps made 1938 repeat rounds, ongoing evidence of how far his reputation (and the film's) had come in so brief a time, and still well ahead of US landfall to do Rebecca. 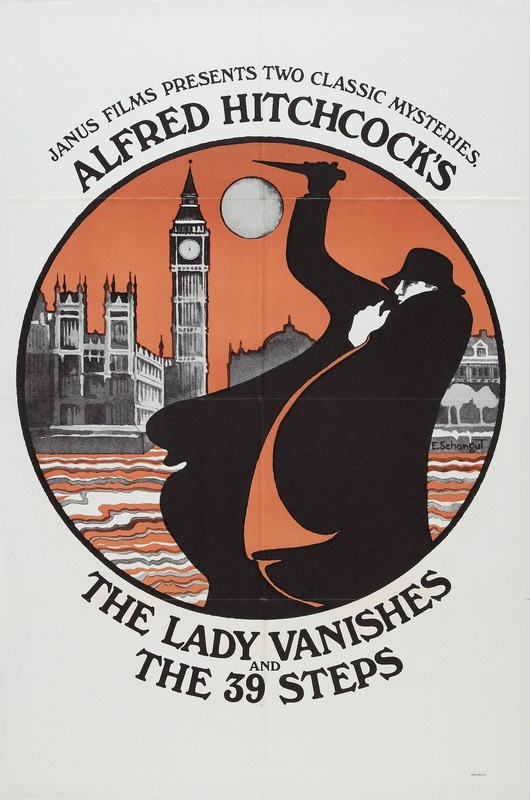 Janus Films by the sixties took distribution reins stateside for The 39 Steps, often pairing same in revival bookings with The Lady Vanishes, the two an ideal (and not overlong) night at art/revival houses. Janus scored non-theatrically as well for Hitchcock's by-then anointed classic, The 39 Steps renting for $80 to schools and $100 plus elsewhere. Up-from-piracy Tom Dunnahoo misunderstood The 39 Steps to be Public Domain and offered 16/8mm "BONAFIDE ORIGINALS" in his 1974 Thunderbird Films catalogue, which made me wonder at the time how in the world Tom got his hands on a so-called "35mm Production Negative" for mastering prints (had such a thing even survived into the 60's?). He offered 35mm as well for theatrical bookings --- you'd wonder what those looked like. Some legal department surely shut Dunnahoo down for his infringement, but whose? We've since had The 39 Steps in abundance on DVD, Region 2 Blu-Ray, and lately streaming. Enthusiasts have been years trolling for perfection among versions tendered. Several I had in 16mm approached good, but couldn't get far beyond it. Criterion's initial DVD improved on past offerings, but their Lady Vanishes looked better. DVD Beaver expertly covered a Blu-Ray from England and noted but slight advance over what we'd had. A Netflix stream I saw was quite nice and bore an MGM logo. Does MGM control all domestic rights? Now comes announcement of Criterion's forthcoming Blu-Ray, for which many have highest hopes, myself included. Will The 39 Steps finally play as crisp as it did to Roxy crowds? 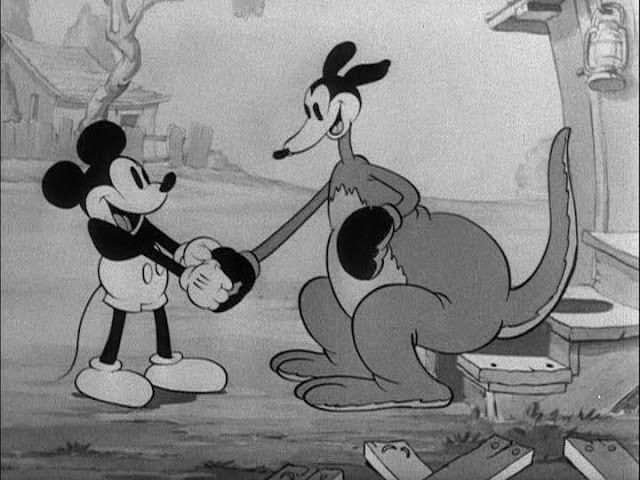 I'll be sure in any case to run Mickey's Kangaroo ahead of it, just for luck. Very entertaining and well researched post about one of my favorite Hitchcock titles. Thanks loads. Here's your selected short, John! John, thanks so much for this terrific post -- what a terrific lot of research this is on a film I just saw again recently, and loved. One of the best things about this blog-a-thon is the chance to get to know other film bloggers out there -- and yours is one I'm very glad to learn about. Kudos on a great piece! I thought a number of British films such as 39 Steps and Pygmalion actually WERE public domain in the US until a change in copyright law that matched us up with European regs. I remember Janus/Films Inc. catalogs that stressed how they were the only distributors paying royalties to the heirs of the filmmakers involved... somehow as a 16mm programmer then, I wasn't swayed by the thought of Patricia Hitchcock or whoever Shaw's heirs were going hungry if we didn't pay $125 for The 39 Steps or Pygmalion from Films Inc. and got it for $40 from Images or Em Gee instead. Hi Michael --- My impression at the time was that "The Man Who Knew Too Much" and "Young and Innocent" were PD, but that "The 39Steps" was renewed in the early sixties (but by who?). Anyway, I'm pretty sure Tom Dunnahoo pulled it out of Thunderbird's catalogue at some point after the 1974 listing. Dan Mercer considers Hitchcock in England ... and then Hitchcock in Hollywood. I was looking through some books I have on the life and films of Alfred Hitchcock and all of them tell the same story, that his British films were released in America only in the big cities but that he won over the critics in this country anyways. There is some truth to it, in that he did win over the critics, which is really to say that he won over NewYork, which was about the same thing. The details you provide in your article, however, about Gaumont British's hit-or-miss release of The 39 Steps, mirror the reasons for Hitchcock's discontent during this crucial period in his career. By this time, he had become quite frustrated with working in the British film industry. He was tired of waiting for financing to be cobbled together for a project, tired of the rushed shooting schedule when it finally was, and tired of working with marginal talents in the technical departments. He was also tired of the English weather and tired of waiting days after setting up a shot for the rain stop, as happened during the filming of Sabotage. 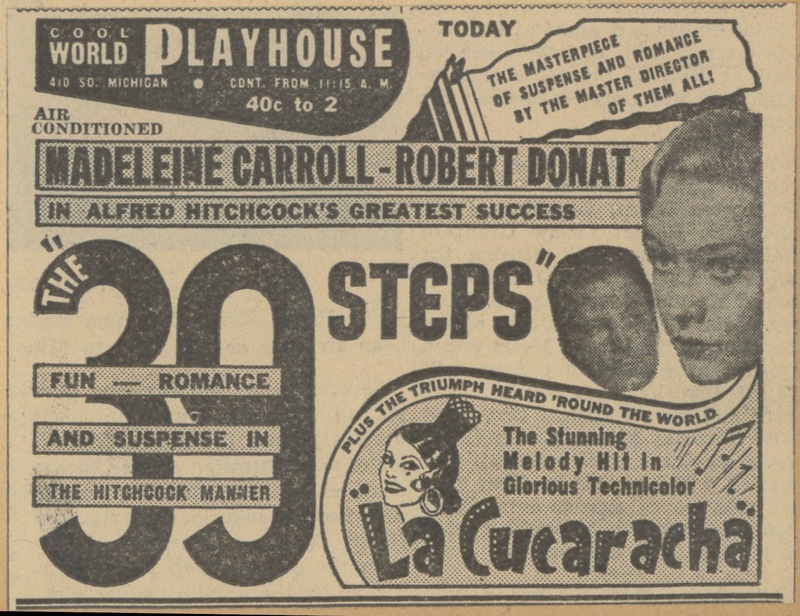 If Gaumont British couldn't find venues in America for the release of a film as good as The 39 Steps, he needed to move on. Sunny Hollywood with its well-capitalized studios beckoned to him like the promised land. Ironically, when he was engaged by Selznick International Pictures and began making films like Rebecca, Suspicion, and Foreign Correspondent, many of the American critics who had championed him now found fault with his work. It seems that they had associated the raggedness of some of his British pictures with a rawness and vitality, which they liked and which distinguished the pictures from the usual Hollywood product in their eyes. All he'd really been doing was trying to maintain continuity in spite of not having shots of the quality he wanted. By starting to make slick, well-produced pictures, he'd seemingly gone Hollywood, and these critics regretted it. In truth, however, the mature artist who later made films like Notorious, Strangers on a Train, The Wrong Man, and Vertigo could only have done so in Hollywood, with its production facilities and distribution. It would seem that even the darkness of his vision required the California sunlight to reveal it. I believe other outfits (Niles, etc.) 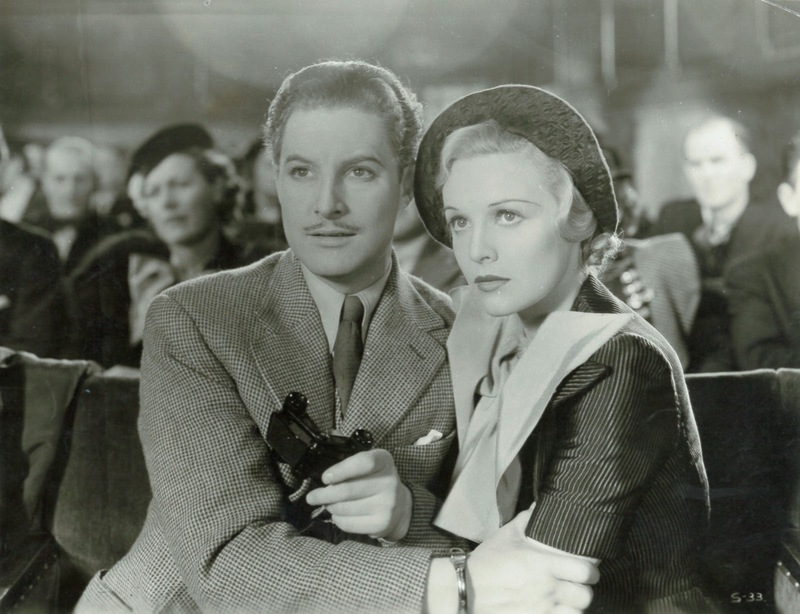 offered 16mm prints of THE 39 STEPS as well as Thunderbird. Niles, of course, consistently offered the worst prints of everything. While critcial reviews are interesting to read they are, after all, only one person's opinion. We tend to think the media choose critics based on their expertise. The reverse is true. They are picked for lack of it as their editors feel they will reflect the feelings of ordinary readers. It is entirely possible that the actual audiences loved the cartoon. We have only to read the critical reaction to the first short films of D. W. Griffith to see out out of touch critics can be and all too often are. Critics complained they had paid to see the entire boy of the actors not disjointed and frightening close-ups of body parts. "Why does Griffith have to jump around in time and space? Why can't he create films like other people?" was a constant refrain (I am cutting it short here). These were university educated people. What about the great unwashed herd of the common folk who made up the audience for moviers? How did they react. Today a company--any company--would be happy to realize 1% profit on an investment. Biograph got 1000% profit on their investment in Griffith. Ditto Chaplin who was constantly criticized for bad taste and vulgarity. Then there is Bosley Crowther's review of HOUSE OF WAX where he complains of both the stereoscopic image and the stereophonic sound. We can top that off with Buster Keaton's THE GENERAL which almost no critic of the day liked. Critics are the last people we should pasy attention to. I like the raggedness/rawness of his UK movies as did the US critics, even if it was unintentional. And Hitchcock's early movies were still miles above most of his UK contemporaries. I'm a 16mm film collector. I've got catalogs from the 1970s listing THE 39 STEPS from Niles, Reel Images, Cantebury Films and Select. As late as 2004, Golden Era Films was selling it in 16mm. It is listed in the 1978 and 1982 Thunderbird catalogs that I have. After Thunderbird went out of business, Morcraft Films offered their library, and it is still listed. I just acquired a Thunderbird 16mm print, and the picture quality is pretty good. We'll be showing it at our Dallas-area film group next month. Not only did the film's "foreign" status hurt it at the box office, but it really needed a major studio marketing effort behind it.